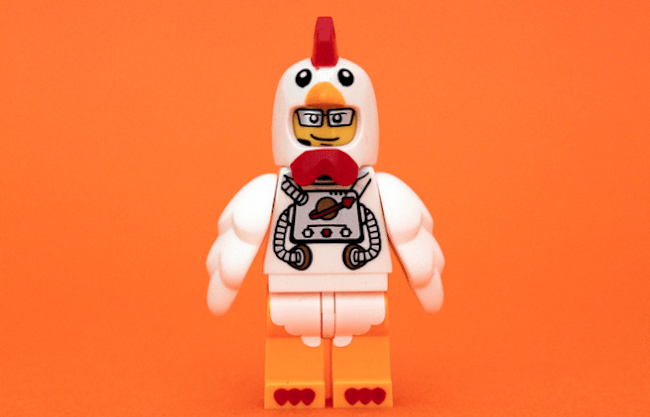 Home›Investor Financing & Creative REI›Just Get in the Chicken Suit: Our Marketing Campaign Begins! This is the 2nd installment in our epic investing journey. Read Quit Job…Check. Move Family out of State…Check. Become a Full-Time Rockstar Investor in 8 Months…? to read the first post. What’s much more exciting than the actual move is my husband’s permanent move from corporate aviation to our fulltime investing business. Let me catch you up on some REALLY exciting news since the last time I wrote. Within a day or two of my post going on BiggerPockets, we got an offer from a rockstar investor to coach us. Glenn Schworm (or maybe an angel sent from heaven who goes by that name, I’m not sure yet) will be helping us transition from wannabe to legitimate rehab investors. Glenn and his wife, Amber, have flipped over 100 houses in the 5 years since they started and have a long-term goal to coach and help many more like us. A big part of their business is marketing and their guidance has already been invaluable as we navigate our decisions. And they happen to also be really great people! 2. Kick our relationship with the MLS to the curb like a bad deadbeat boyfriend and start marketing. So I looked at my precious kids with tears in my eyes and decided I wanted a better life for all of us… Well, actually, I imagined continuing my life day in and day out in a constant insanity of screaming children, sleepless nights, tearing my hair out and having NO HELP. s got to be at least a handful for me, right?” Let me explain some of the things we’ve tried: using my husband’s broker license, not using his license and working with a well connected realtor, short sales, pendings, severely distressed homes, redtags, long DOM’s. We were on every lead immediately and used every strategy we could think of to make it happen. The problem with the MLS is…in an active market you will always be outbid by other buy and hold investors, homeowners or other rehab investors who are using risky profit margins to seal the deal. Yes, you may be able to pick up a house or two, but if your goal is to build a full-time rehab business, it ain’t gonna happen. You spend your entire life trying not to look stupid, not to stand out. When all the other kids were wearing neon, you didn’t wear black, you wore the neon. 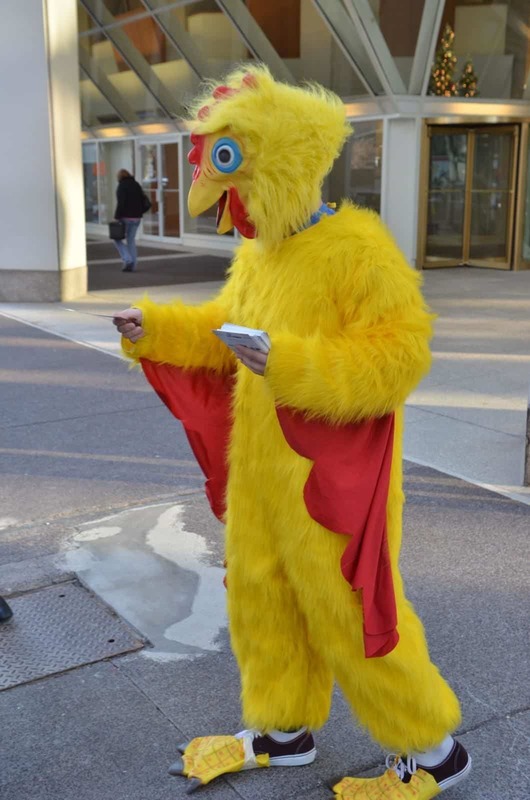 You don’t just wake up one day and decide to put on a chicken suit and dance on the street corner to bring in the investing leads. But that, my friend, is the choice you have to make. I didn’t start out so much a fan of this whole marketing schpiel either. Sending a bunch of mail to a bunch of people who don’t want it, posting signs all over my town and then running away from mysterious sign police (really, these people exist?? ), leaving business cards, like everywhere. Weird, annoying, and definitely cheesy. I didn’t want to be “that person”. That weird sales guy (gal) with the awkward smile like he knows you and fake manipulative words that aren’t really that creative. Once I went to a timeshare presentation to get that “free trip” to Las Vegas and somehow ended up in a back room with The Hardseller. I felt like I survived an actual battle by the time I left. Ok, so what’s this marketing gig going to look like? We plan to be flipping upwards of 5-10 houses at a time. That may seem like a lofty goal, but here’s the thing: If you set a “realistic” goal you may or may not reach it but you are much less likely to exceed it. However, if you set a big goal and make decisions accordingly you are much more likely to at least get to the same ballpark. Take this as an example. An organized infrastructure, systems and a great team are needed to support a big business. Flip 1 house at a time, think, “Hey, I can just do this work myself. That won’t be too big of a deal. I can also answer my own phone calls and hang my own bandit signs” Plan to flip 10 houses at a time, think, “Are you kidding me? I don’t have time to hammer even one nail. I need to focus on generating leads and closing deals, line up a phone answering service (thank you Glenn, for getting our heads on straight about this one! ), and outsource everything I possibly can”. Make decisions like you run a big business before you actually have a big business, it will be critical to your success. We learned on BiggerPockets that if you plan to do marketing, you should do several different techniques (we’re doing five), do them well and do them consistently. Our budget is $1000/month. We’re rolling out one strategy at a time, making sure each one is well organized before moving onto the next. Before buying the trip around the world and the fly fishing cabin, we’re putting the money that we make back into expanding our marketing. The income to marketing cost ratio is astronomical if done correctly, so it would be foolish not to continually expand this part of the business. Several ads, reposted consistently and strategically. BUSINESS CARDS: Leave. them. everywhere. Objective: mail to 600 out of state absentee owners 6 consecutive times, 1 month between mailers. 300 mailers white with “handwritten” letter and letterhead and 300 also “handwritten” on yellow “lined paper” (I created the lines in a Word Document. I’ll upload the file to the BiggerPockets Fileplace for your use) to do a test run. The campaign will be letter, letter, postcard, letter, letter, postcard. Postcards will be black typing on canary yellow paper. After the 6 mailers we will wait 3 months and begin mailing to the same addresses again indefinitely until we either get a lead or someone asks to have their name taken off. During the three-month break, we will launch a 2nd set of mailers (the same mailers) to an additional 600 addresses. It’s important to not do all at the same time in order to test the original mailers’ effectiveness and make any necessary changes. Envelope Specifications: Our letter mailer will be white and personal letter size. Think about this, if you opened your mailbox and there were 5 business-sized envelopes, some handwritten, some not and there was one small envelope that was handwritten and looked like a letter from grandma, which one would you open?? I put my bets on the small letter, but I’ll let you know how it goes! Letterhead only: purchase of letterhead only, in-house printing $150. Elance: Just the printing for letters and envelopes $200. UPDATE: We went with an AMAZING bulk mailer on Elance who is charging us $470 for the entire 600-mailer job, including postage. Awesome! The first 300 white letters went out a week ago and so far we have had a poor response. Only three phone calls, but remember, this is only the first of five campaigns we will be launching and it typically takes someone receiving your mail at least 4-6 times before they respond. We are also tweaking the wording before sending out the 300 yellow, lined mailers. We’ll keep you posted! We’ve ordered the signs and plan to make our own Sign Stapler (found instructions online). I’m mapping out the routes now using a property value heat map I found on Trulia and Google maps. Then we will drive the routes, hire Craigslist posting person, and go to town. 50 signs out at a time, replace ones taken down, locate signs high up with sign stapler so not easily taken down. Sooo, this has been a bust so far. I tried to contact wholesalers I found on BP and Google, heard back from only one who said they aren’t wholesaling anymore. Where are you people??? Drive around and write down addresses of distressed properties. Actually handwrite notes to these until we have too many to keep up with. These should prove to be really good leads. $1500-$2000 finder’s fee to anyone who refers a house to us. We have verified this is legal through the CO Department of Real Estate. Catch up with us next month when I update you on the progress of each campaign we’ve rolled out so far and explain our straightforward approach to building a website. Did you have a hard time embracing the marketing process? What has your experience been like so far? Fantastic article and details! I wish you great luck. I started marketing this year as well. Thanks so much Mark! Good luck to you too, hopefully we’ll meet up one of these days at one of the REIA meetings! Just wanted to update you, about 7-10 days from my first mailing I got my first deal. I passed it along to a my friend who has a lot of experience. I did this because I’m still working out of town 1/2 week. Also the houses price range and the fact that the comps were all over the place in this rural custom home area made this too risky for my first flip. We closed on it today and I made a quick $5,000. Good luck! Congratulations, Adam, that’s huge!! Keep going, you’re on a roll!!! What a great article, please keep us updated on your progress! Thanks Taylor! Where are you at in your investing journey? Great article, Amanda really enjoyed it, I look forward to hearing your results with your marketing campaign. Thanks so much Perry! Where are you at in your marketing journey?? Marketing is the key to success. Keep it up and the leads will come. Thank you so much, Sharon! I find A LOT of encouragement in your words. We have been swimming upstream for a long time now and it is such a relief to continue to hear that if we implement the marketing strategies (and do them well, of course), the leads will come! You’re new to investing, you’ve got all this going on, AND you had time to write it all out? The key to marketing is consistency over time. Hah! Thanks Karen!! I know, and I keep pinching myself that I’m writing on BP as a newbie. How did that happen?! 🙂 I really have admired you since I have been on BP. Thank you for all the help you have given so many of us newbies, especially when you must be really busy yourself!! Awesome post. I really appreciated the level of detail when describing your marketing plan. I wish you the best of luck. Can’t wait for your next post to hear how things turned out. Hi Chris, thank you! Next post we’ll detail the leads we’ve had so far and hopefully our first deal! Where are you at in your investing journey?? How exciting Chris! Good luck to you!!! As a fellow intrepid investor, I really enjoyed your article. You’re way ahead of me, I’m still working on getting my website together. It is easy to be overwhelmed by all that needs to be done to become a mediocre investor, let alone a good one. But, I’m am getting measured for my chicken suit:0) I like your writing style it’s funny and engaging. I look forward to your travelogue on what it takes to become financially independent. Good luck! Thanks, Maurice! The website was pretty overwhelming for me too. Keep with it, you’ll get there!!! What program have you been using to build your site? My background is in design so if there’s any way I can help, shoot me a message! Amanda that was a very inspirational article. I look forward to reading more on your progress. I have not yet done any type of marketing but have been looking into doing so. After reading this you have given me some avenues to look at. Good luck in your campaign. Good luck to you too Chris! Keep us posted! Great article Amanda, I remember the “swimming upstream” stage of our business too when we got going back in 2008. Indeed, marketing is the key. Consistent marketing that is. I wish we had realized early on how important follow up is too once you have prospects in your system. Once people call in now and we are close on price or terms but just not quite there yet….. We will always keep them in a call and email follow up for at least 18 months. It seems tedious and like you are wasting time in the beginning, but after a year of building your follow up pipeline you’ll start getting people contacting you back about a follow up call or email you have been sending for months. The other day we had a guy call in and say, “I’ve been getting your emails for over a year now. I am ready to sell.” We just signed that deal this week. I wish you much success on your journey! Thank you so much Julie! Your comment is especially poignant right now as we have hit some bumps in the road with our marketing. I’m discouraged, but not broken. It’s difficult to continue on when you haven’t yet experienced the success that give you a boost. We have been “continuing on” without a deal for 2 1/2 years now and I’m feeling pretty burnt right now… k, I’ll wallow for the night and wake up fresh-eyed and bushy-tailed and ready to go again tomorrow. That is a very comprehensive article! Good job. I’m a little confused that you said your husband was able to lose the job and go full time rehab but in the last reply you say it’s been 2.5 years and no deals. Do you mean no leads? You haven’t gotten one motivated seller from all the marketing? That is surprising to me. Are the leads just not converting into a sale? That’s some serious determination to continue on that long with no money coming in. Good for you. I do think that something needs to be tweeked somewhere though. Great decision to get a mentor : > It definitely cuts down the learning curve. p.s. I always market to the same list til the property sells or they ask me to take them off the list. Hope you do too. Can’t wait to hear your success stories!! Thanks for your comment, Melodee, and I’m glad you asked for clarification. That was confusing! Aaron’s flying job was all or nothing, so he might be gone for 7 days straight and then be home for 7 days. When he was home, we would split our time working on the investing. We maybe averaged 20 hours a week for those years. We were only looking on the MLS that entire time until this past May when we completely stopped and put all of our efforts into marketing. Aaron left his flying job a few weeks ago and we are now fulltime pursuing investing via marketing. What other marketing have you done besides direct mail? What have you found to be beneficial?? I love direct mail but have regularly found sellers—and buyers—thru CL. And I have found wonderful wholesalers to partner with in the areas I like to work thru my CL marketing. These are such fulfilling alliances because we help each other out. I never found success until I just went bonkers with the marketing. I pay my va to send out hundreds of emails per week. I think working with Glenn you will become sharper at converting your leads—-that was the hardest for me to learn. And I am still not near as sharp as I want to be. Thanks, Melodee, so helpful!! I’m realizing the further we are in pursuing the bandit signs that I’m really not keen on continuing to do them longterm. The whole thing just isn’t sitting well with me. We’ve got 500 to get rid of and I hope to replace any activity we get from those with other marketing avenues. Did you ever do bandit signs? I work virtually in 4 different states so I don’t personally do them but my associates use them so I get the benefits. If I was to do them I’d have to hire someone because I just don’t have the time or patience. I also wouldn’t like the stress that seems to be attached to the whole “sign police”. But don’t even let me get on my soapbox about that topic (it would start with saying “they don’t have more important things to do??????? Reallllly???). See what I mean lol. I like the idea just haven’t tried it since other things are working for me. I don’t mean to be intrusive but I’ve been following this post hoping to gain some insight in the marketing arena myself. And I’d like to say I have. If you don’t mind me asking Melodee which company, if any, are you using to put together your mailing for your direct mailing? I have heard of a few different sources through the podcast on BP but am interested in inquiring from someone actively using a company. Also how effective is using a VA for generating leads? You are not being intrusive—at all. I have used direct mail for years and had excellent results. Back in 2004 & 2005 I used it to generate leads from pre-foreclosure lists. (I took a break for several years due to personal challenges and clueless-ness how to maneuver the crazy market —DARN IT!!!!) Now I use it to inheritance lead lists from US Lead List. I don’t get paid for sharing that but you could tell Lance I sent you. It’s always nice to know that people we like are spreading the word. What I like about how Lance does his business is that he works solely in the inheritance niche and only puts out a list 4x per year AND only sells each county to 3 people!! He doesn’t repeat the leads in the next quarter so the leads are always fresh as possible. Marketing is truly TESTING what works and when but it takes an ongoing effort. The last BP Podcast was excellent for pointing out that you can’t change up your marketing quickly and you can’t give up after one or two mailings. If you do change it you only want to change one little thing to see if you generate a better response. If you do you will never know what works! But let me repeat—-another word for marketing is test-test-testing. There are lots of experts here on BP that are far better I am sure. I know what has worked so far and still will continue to slightly tweek to see what works. Hope this has been helpful—it sounds a bit ethereal as I re-read it. Just what I know in this moment. Thank you very much Melodee for the insight. Nicely put about lead list companies, unfortunately you just don’t know which ones to get involved with. At least now I have some direction. In the beginning we exclusively focused on wholesaling houses. Which looking back was actually a good way to go, but the problem was we weren’t doing enough direct mail. We would send out a couple hundred letters per month usually. Also, we were sending letters to prospects that were easy to obtain information about. If the lead are easy to get, the competition will increase significantly. Wow, Julie, this is so insightful! Thank you so much! I think what we need to do is get our marketing strategies off and running, well organized. Once we have a couple of deals under our belt go back to each strategies and ramp it up strategically like you are suggesting. We’ve got the direct mail going, but there is a huge amount of room for expansion once we have the marketing dollars to reinvest. Just thinking out loud, again thank you so much!!! Good luck with the marketing. Even though you are still new and just ramping up the marketing it is get to see your plan and what you have found out from your initial research. Thanks Shaun! That was definitely my hope in writing this blog. It will hopefully be educational for all of us newbies!! And I agree, the comments are AMAZING – so helpful! Good luck to you!! Ok Amanda, my computer has been down for the count but I am back up and running. Angel I am not so sure about. I am pretty sure that was never an assumption of me growing up! However I do see that this was a very detailed post that must have taken some time to write, and while good, as your coach, I think that if you used that time to buy a house you would be one step closer to your dream. 🙂 Just saying… 🙂 Talk to you guys soon. Hi Amanda. We know you’re going to make this work and can’t wait to see the whole process play out. This is going to be a great story and inspiration to all. We just started investing here in Houston and you have lots of good info on here for us to get started with. Looking forward to your next post! Great article Amanda, thanks for sharing your journey with us, look forward to reading more!